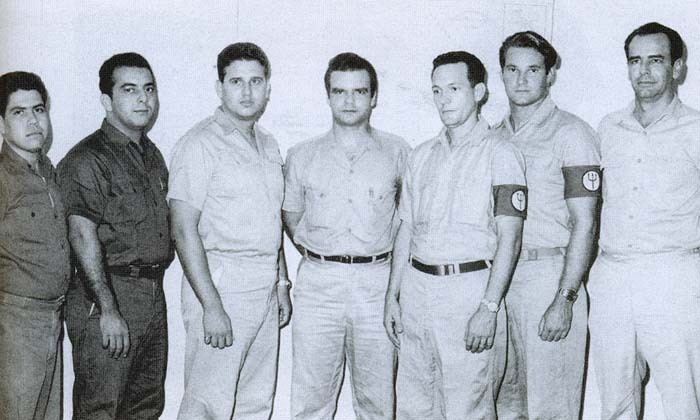 IN 1959, a young officer and businessman from Texas received directions to cooperate in funding the nascent anti-Castro groups that the CIA decided to create, but it wasn’t until 1960 that he was assigned a more specific and overt mission: to guarantee the security of the process of recruiting Cubans to form an invasion brigade, a key aspect within the grand CIA operation to destroy the Cuban Revolution. Jorge Mas didn’t know how to thank Félix for what he had done for him. From that moment he was constantly grateful to him and, at the same time, obedient to his every petition. For his part, in his "Report on a Censored Project," Dr. Carl Jensen of Sonoma State College states: "… there is a record in the files of Rodríguez and others involved in the Bay of Pigs invasion, which expounds the role of Bush: the truth is that Bush was a senior CIA official before working with Félix Rodríguez on the invasion of Cuba." It is possible that this investigative reporter real name is Steve Kangas rather than Paul Kangas. Steve Kangas was working on a book about CIA covert activities when on 8th February, 1999, he was found dead in the bathroom of the offices of Richard Mellon Scaife, the owner of the Pittsburgh Tribune. He had been shot in the head. Officially he had committed suicide but some people believe he was murdered. In an article in Salon Magazine, (19th March, 1999) Andrew Leonard asked: "Why did the police report say the gun wound was to the left of his head, while the autopsy reported a wound on the roof of his mouth? Why had the hard drive on his computer been erased shortly after his death? Why had Scaife assigned his No. 1 private detective, Rex Armistead, to look into Kangas' past?" While there is probably some truth in the Granma article, it is mixed in with so much hearsay and non-fact that it is essentially lost. Yes, it would be interesting to hear what Veciana and Quintero have to say... but what is this stuff on Rodriguez working as a recruiter? In my opinion, this Granma article is a knowing collection of half-truths and innuendos designed to counter-attack Russo and Huisman's movie. The U.S. Government isn't the only one that lies to its people. The Granma article on George senior's services for the Bay of Pigs and subsequent operations is fascinating. Is that why one of the invasion ships was named the Barbara J? And why did George de Mohrenschilt's telephone register contain the name and address for Poppy Bush and his oil company Zapata? In 1974 Frank Sturgis told me that Hunt said they were burglarizing DNC to prove that Castro had sent $200,000 to the Democrats. Frank obviously is referring to the photos of the "three tramps" in Dealey Plaza. I spent two days riding around with him and can attest that he isn't in the pictures. I believe Martinez claimed that Hunt lied to the Cubans in order to get them to help out in the burglary. Evidently, Hunt used the fact that Castro had sent McGovern a list of CIA assassination attempts on himself to imply that McGovern was in bed with Castro. Consequently, one of the things the "burglars" were told to look for in the DNC was anything connected to Castro. Sturgis' story seems to be consistent with Martinez'. Here are three from that group. Quintero on the right. Inside the Shadow Government was published in 1988. Written by Edith Holleman and Andrew Love, the book is the declaration of Plaintiffs’ Counsel filed by the U.S. District Court, Miami, Florida, on 31st March, 1988. The lawsuit was filed on behalf of two U.S. journalists based in Costa Rica, Tony Avirgan and Martha Honey. The 29 defendants included several members of Operation 40. This is what the document has to say about Rafael ‘Chi Chi’ Quintero. (2) Thomas Clines worked under Ted Shackley as a case officer for Operation 40. Clines directly supervised many of the Cuban exiles including Rafael Quintero, Felix Rodriquez and Raul Villaverde. Edwin Wilson also worked under Clines as part of Operation 40. (3) Shackley brought Quintero, Villaverde and Rodriguez to Laos to train men to perform assassinations. Quintero was a specialist sniper. (4) Between September 1973 and April 1975, Shackley, Clines, Secord and Quintero siphoned off a percentage of the funds derived from the opium profits of Vang Pao. (5) Shackley, Clines and Quintero had strong ties with the Nugan Hand Bank. (6) Clines, Wilson, Shackley, Quintero and Ricardo Chavez (another member of Operation 40) set up American Petroleum Institute Distributors (API). (7) Shackley, Clines and Quintero helped arrange the assassination of anti-Shah activists in Iran. Rafael and Raul Villaverde were used as assassins. (8) In August 1976, the top three managers of the IBEX project – William C. Cottrell, Robert R. Krongard and Donald G. Smith were assassinated. Gene Wheaton believes the men were killed to cover up a scam for skimming profits from the IBEX project. Wheaton also believes that Secord, Clines, Hakim, Shackley and Quintero were involved in these assassinations. (9) Quintero told Wheaton that “if he were ever granted immunity and compelled to testify about past acts, it would be the biggest scandal ever to hit the United States”. 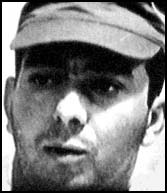 (10) Between March and July 1979, Quintero supplied arms and munitions to Anastasio Somoza. (11) William Buckley, the CIA station chief in Beruit, worked with Quintero at the Pemex Corporation in the early 1980s. (12) Quintero was providing arms to the Contras from March 1984. (13) In 1986 Quintero asked Felix Rodriguez to obtain a fraudulent end user certificate from an official in El Salvador. (14) In July 1985, Oliver North had a meeting with Secord, Clines and Quintero concerning funds for the FDN. (15) In March 1986 Quintero was in Costa Rica managing an airstrip. (16) Quintero had originally been trained as an assassin by Carl Jenkins. Are there any frontal photos of Quintero? Judging simply from his profile he looks like he could be a candidate for Lamppost Man at Main and Houston. Thanks. So much for Lamppost Man. Picture taken in 1964. Rafael Quintero is second from the left and Manuel Artime is in the middle. Does anyone know the names of the other men in the picture? James, do you know the answer to this question? I would only be guessing but the guy on the far right looks a bit like Jose Bacallao Perdomo and the guy third from the right might be Roberto Perez San Roman, but like I said, I am far from sure. The guy on the far left appears in other group photos of Quintero and MRR guys but I don't know his name. Thank you for that. The photograph is actually owned by Quintero but he was unwilling to identify the other men in the picture. Like I said, John, I am only speculating here. The guy to Artime's right could be pilot Hector Varone. A profile shot of him will be available on the web site that will support Larry's upcoming book. The only thing that Quintero says about the photograph is that it shows the leaders of Artime's U.S. supported "autonomous group" that operated against Cuba from bases in Nicaragua and Costa Rica. That should narrow it down a bit.